FireWire is a trademark of Apple is at once the most popular name for the standard data cable serial interface IEEE 1394. Sony introduces i.LINK IEEE 1394 with the name. Although the name is different, all three (FireWire, IEEE 1394 and i.LINK) both refer to types of data cables that can transmit data at speeds very quickly, until at an average of 400 megabits per second (Mbps). Conductor channel FireWire data claimed as the fastest and stable among other channels such as USB. The new generation of FireWire is born with the advent of FireWire 800 (IEEE 1394b), which Apple introduced in 2003. FireWire 800 has doubled the speed of the IEEE 1394 predecessor (called IEEE 1934a or FireWire 400), and it can deliver data to the average speed of 800 Mbps. In addition to growing rapidly, IEEE 1394b also able to be used with a longer distance than its predecessor. A FireWire 800 cable to provide cable lengths between the computer-to-tool and tool-with-tools to the max as far as 100 meters, while the optical repeaters FireWire 800 can even plug in as far as 1000 meters. But however, the speed and distance that can be pursued still depends on the type of cable used. FireWire has been used as one of the standard connection interface between digital audio-visual equipment with computer, such as digital cameras and digital video cameras. 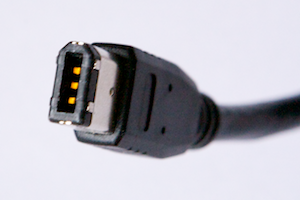 Products that use FireWire technology usually provide a process that requires high-speed connection. For example for example in the use of external hard drives, printers and scanners, webcam (for video-conferencing), an external DVD burner, transferring movies from digital video camera into the computer’s hard drive, right down to the voice recording via FireWire-based external sound card. Everything without losing performance or hangs. Almost all computer products and the latest laptops, are now equipped with a FireWire port facilities built-in ‘. contemporary digital video cameras also use FireWire as one of the standard input-output devices since 1995.
detect the FireWire-based devices are connected and ready to be empowered / used. In performance, FireWire does not involve a computer processor memory, so it’s not so stable and easy to hang. The cable connector can be removed without having to turn-off device or interfere with the performance of the host computer (hot swapping). Able to connect and recognize up to 63 FireWire-based devices simultaneously, without disturbing the performance of one-another. Can be used even without having to connect to the computer-even-as a mediator, for example when using a scanner and printer (peer-to-peer). Cord can carry up to 45 watts of electrical energy that we can summarize the use of cables. The line-free noise (noise-free), which is used as a standard tool of modern recording studio.